The Burton Review Rating: can't decide between 4.5 stars or 4.75. Let's just say I enjoyed it! "Beginning on August 9, 1945, in Nagasaki, and ending in a prison cell in the US in 2002, as a man is waiting to be sent to Guantanamo Bay, Burnt Shadows is an epic narrative of love and betrayal. With the partition of India, and the creation of Pakistan, Hiroko will find herself displaced once again, in a world where old wars are replaced by new conflicts. But the shadows of history--personal and political--are cast over the interrelated worlds of the Burtons, the Ashrafs, and the Tanakas as they are transported from Pakistan to New York and, in the novel's astonishing climax, to Afghanistan in the immediate wake of 9/11. The ties that have bound these families together over decades and generations are tested to the extreme, with unforeseeable consequences." Instead of repeating the sequence of events that are outlined in the blurb, I am going to skim the details. And for those of you who read my review of the new novel, "The Wish Maker", let me say that what I was hoping for in that novel has been deftly achieved here with Burnt Shadows. This novel's events begin with and then reflect upon the aftermath of the atomic bomb the USA dropped on Nagasaki in 1945 that alters Hiroko's life forever, and this is one of those stories that stays in your mind long after you read it. The novel follows Hiroko and her family as she moves from Nagasaki to Bombay, to Istanbul and to Karachi, Pakistan and ultimately to New York City; sadly, the wars of the nations following her. The prose was just beautifully written and so very descriptive that I was easily imagining the landscape surrounding the characters. The grief from the loss of Hiroko's loved ones throughout the story was delicately palpable, without calling direct attention to it, yet the words are so powerful that I had to put the book down to savor the full meaning and to not lose the poetic prose of the moment. Along with Hiroko, we also have Elizabeth and James Burton, and Sajjad who worked for the Burtons. The characters were all very well developed as the narration gracefully divides its time between all of the above characters. The Burtons' and Hiroko's lives become unexpectedly intersected upon the death of Konrad Weiss, Hiroko's first love in Nagasaki, and their new found relationship develops into a natural familial one. Sajjad then gets tangled among the web by falling in love with Hiroko and we feel pained for them as they each struggle to find a place in a society amongst a war torn country with its social conflicts between its political barriers. We easily transition from the different points of views of each of the characters, and I was pleased with how unbiased the view was on the war from the author; we see how each of the characters react to the effects of events so that we can better learn the truth of the political system and the cultural divides they faced. This novel spans generations, ending after the attacks of the Twin Towers in NYC. Although this event occurred during the timeline of the book, the author did not go into the details of the horrors, which is something that I was secretly glad for, due to being from New York that is indeed close to home. "She could not tell anyone, not even this man with the gentle eyes and an understanding of the scent of the gods, how Yoshi had left her with the stone for a few minutes while he went in search of implements to dig with and she had lain down on Konrad's shadow, within Konrad's shadow, her mouth pressed against the darkness of his chest. 'Why didn't you stay?' she had whispered against the unyielding stone." 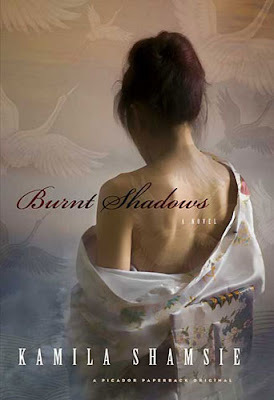 And the Burnt Shadows, which appear physically as burns in the shapes of birds on Hiroko's back, haunt Hiroko for the rest of her life, as she dreams of them and as she becomes an outcast due to the fact she survived the bomb, and millions did not. She is labeled as a Hibakusha, a victim of the bomb: she could have been carrying a disease and her child could have been also. In the story, when Hiroko is fearing for her teen-aged son Raza, the author writes: "The birds had their prey....She had not imagined the birds could fly outwards and enter the mind of this girl, and from her mind enter Raza's heart." Along with Hiroko's life, we are following the story of The Burtons, and how these families befriend each other in the hard times and become friends for life, born in different countries, and with different nationalities, yet not really having a place to call home. Their offspring do not meet, yet they will always know that they are connected spiritually due to their parents' journeys together. It is their perceptions and their legacies that bring about the climax at the end of the book. There was a slow spot in the last third of the book, as the author was building up to the final moments and once we got there I found that the ending was a bit abrupt. I had not seen that exact outcome coming; I had a different mental picture that I thought was going to occur but I was wrong. It wasn't a bad ending, but I was a bit perturbed that I had gotten to the last sentence and yet still expected a bit more to be said. I guess I could have been selfish and just did not want the book end there, I had savored each sentence and let the story pull me in and I wasn't ready for such an ending. This is definitely a book for the current events of our times; what can we learn from the wars and how can we turn this lesson into reaching something positive from the millions and millions of people that have been innocent victims? How should we consider national paranoia versus loyalty? Love versus hate? The author Kamila Shamsie has such a way of putting a sentence together which speaks volumes of the underlying nature; its multiple meanings dripping heavily from the words. Regret, remorse, grief, sorrow, symbolism and love shrouded in hope for a better future. This book leaves an imprint on your soul, much like the imprint the bomb left on Hiroko's scarred back. A definite recommended read.